Empress Ultra Embedded 10.20 offers many useful features forapplication developers. One of those features is the Empress Hierarchical Query. A standard relational database does not store data in a hierarchical way. 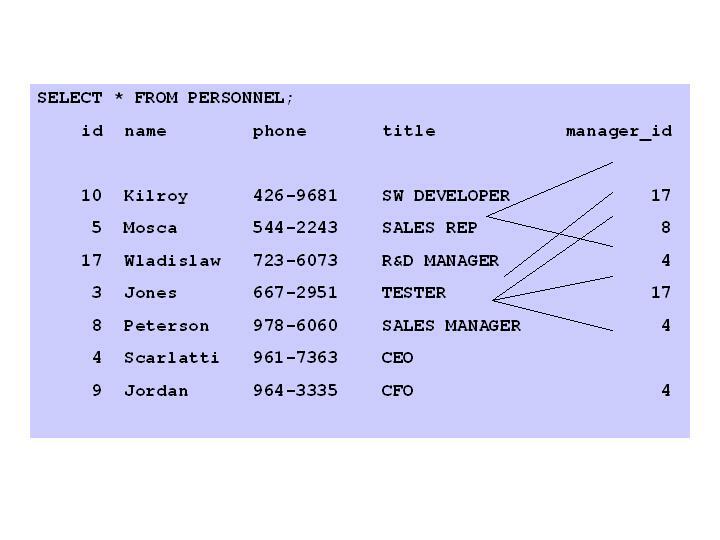 How can you get data from a relational database in a hierarchical manner? The new Empress Hierarchical Query feature is the answer. Empress has extended its relational data management system to satisfy data retrievals that better reflect real world requirements. In many cases, these real world requirements deal with data that is hierarchical in nature. Performing those retrievals in the most efficient and natural manner has been an objective of many database application developers. Empress Hierarchical Query is an extension of a self-join and works on a single table that contains data in a virtual hierarchical data structure. 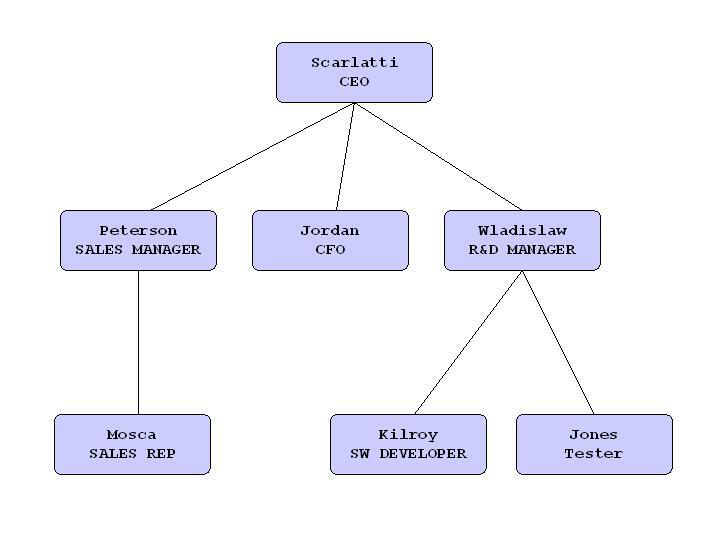 An example of a hierarchical structure is a company organizational chart. We will use the sample personnel table data from the Empress User’s Manual and add title and manager_id attributes in order to make a hierarchical structure. The personnel table is given in the Figure 1. Its hierarchical representation is shown in the Figure 2. START WITH – You can specify the starting root record of the hierarchy using this clause. CONNECT BY – You can specify the relationship between parent records and child records of the hierarchy using this clause. WHERE – You can restrict the records returned by the query without affecting other records of the hierarchy using this clause. 1. Empress selects the root record(s) of the hierarchy. These are the records that satisfy the condition start_with_condition. 2. Empress selects the child records of each root record. Each child record must satisfy the condition connect_condition with respect to one of the root records. 3. Empress selects successive generation of the child records. Empress first selects the children of the records returned by step 2, and then the children of those children, and so on. Empress always selects children by evaluating the connect_condition with respect to a current parent record. 4. If the query contains a WHERE_CLAUSE, Empress removes all records from the hierarchy that do not satisfy the condition of the WHERE_CLAUSE. Empress evaluates the condition for each record individually, rather than removing all the children of a record that doesn't satisfy the condition. start_with_condition the record(s) to be used as the root(s) of a hierarchical query. The clause specifies a condition that the roots must satisfy. If you omit this clause, Empress will use all records in the table as root records. connect_condition specifies the relationship between parent and child records in a hierarchical query. This clause contains a condition that defines this relationship. The connect_condition contain other conditions to further filter the records by the query. The following command selects all the records from the table personnel in the hierarchical manner starting with the record that has title equal to “CEO”. The following command selects all the records from the table personnel in the hierarchical manner starting with the record that has title equal to “SALES MANAGER”. START WITH title=" SALES MANAGER"
Using Empress Hierarchical Queries, you can easily retrieve records by their natural hierarchical relationship from a RDBMS table. Tree walking enables you to walk a virtual hierarchical tree, for relationships in the same table, and select data by their natural hierarchical relationship. Empress Hierarchical Queries are included in the latest Empress Ultra Embedded V10.20. Empress Hierarchical Queries allow you to traverse virtual trees in a relational database using any Empress SQL interface, ODBC, JDBC and the Empress kernel level MR interface. Just give Empress a hierarchical query clause with the record representing the starting node of the tree and the relationship between parent and child nodes and you get the data you want.